You are here: Home / Social Business / IBM Develops an Enterprise Twitter Solution, But Will Anyone Buy It? IBM Develops an Enterprise Twitter Solution, But Will Anyone Buy It? For those employees who tweet during the workday, wouldn’t it be great to have a platform which allowed you to view all of the tweets and activity from all of your coworkers — without the noise and clutter of the rest of Twitter? For most companies, large and small, that want to collect or keep track of employee activity on Twitter, the social media manager usually creates a List on Twitter. This is problematic primarily because all of the adding and removing of employees needs to be done manually, such as when employees join or leave the company. Additionally, the larger the company, the more likely that company Twitterers are working in different divisions on different products, so a single company Twitter List just won’t make sense. I suppose you can create multiple employee Twitter lists — but again, it’s all a manual, labor-intensive process. And wouldn’t it be great if Twitter automatically searched keywords and hashtags of those employees, and organized tweets according to such criteria? Twitter, of course, is leaving money on the table, by not developing and selling this premium product, which could also feature targeted, relevant advertising — but I digress. My ears pricked up and my eyes widened yesterday afternoon when I visited the onsite IBM Innovation Lab at IBM Connect 2013, featuring projects underway from the IBM Research Center for Social Business. One particular project IBMersWhoTweet — the name said it all — intrigued me. IBMersWhoTweet is a crowdsourced solution that invites employees to match Twitter accounts to the employees who own them. Over 500 IBMers have helped classify 7,000 Twitter accounts, and we have studied different ways to increase participation. A fantastic solution to the labor-intensive curation needed to manage and view employee activity on Twitter, I could totally see the enterprise potential of such a product. I had a chance to speak with the IBM researcher on the product, Casey Dugan, about IBMersWhoTweet. I asked if IBM paid for access to the Twitter firehose — indeed, only 4 companies pay for access to the entire Twitter firehose, one of which is Salesforce.com’s Radian6, now part of the MarketingCloud. Casey was unaware of the other major social media monitoring companies (‘I’m not in product management,’ she explained) which I suppose is a good thing: wouldn’t it be great to create something in this world without first thinking about the competition? Of course, an enterprise Twitter solution only works well at scale, when there are at least a couple dozen company Twitterers, with enough conversations that merit the tracking of different hashtags and topics. Peering into the future, a product like this can also allow for non-company outsiders, such as suppliers or vendors, or even clients, to be brought in for additional Twitter fun. There was also no discussion of a mobile version, or if the version was optimized for mobile devices. 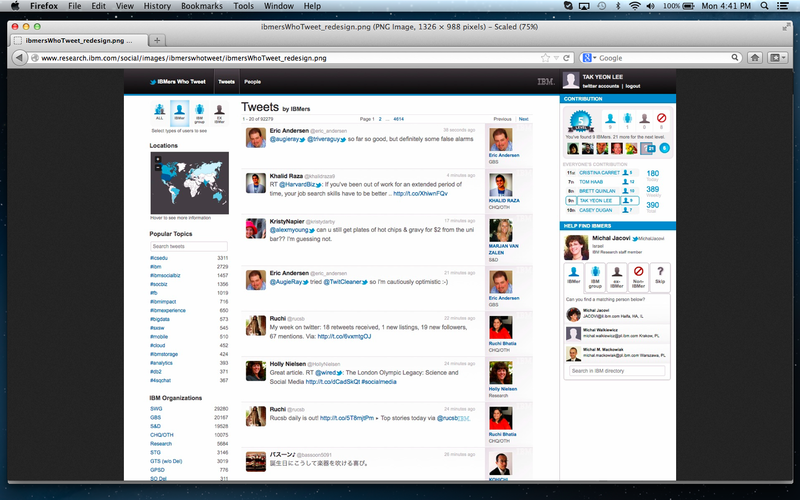 Below, a screenshot of IBMersWhoTweet. The final issue of course is: will anyone buy it? Twitter and other social profile management tools are, for the most part, free. The next step up after the free version of HootSuite costs $5.99 per month. At issue is whether IBM will sell this as a standalone product — and if so, at what price point — or if they would fold this into another collaboration product, like Connections. Is your organization on Twitter? Do you use an enterprise social media tool? I’d love to hear from you.